Medina is city building game for 2-4 players. It's a purely abstract game, but as with any multi-player game, there is a plenty of uncertainty because each player's actions affect the outcome. The official rules are here (for the first edition), and here (for the second edition). Briefly, during the game you will claim four palaces, and score points for the size of the palaces you own, plus extra points for palaces adjacent to walls, palaces adjacent to meeples, and palaces adjacent to the well (in the second edition). The trick is that all the palaces, walls, and meeples are not owned when they are played. 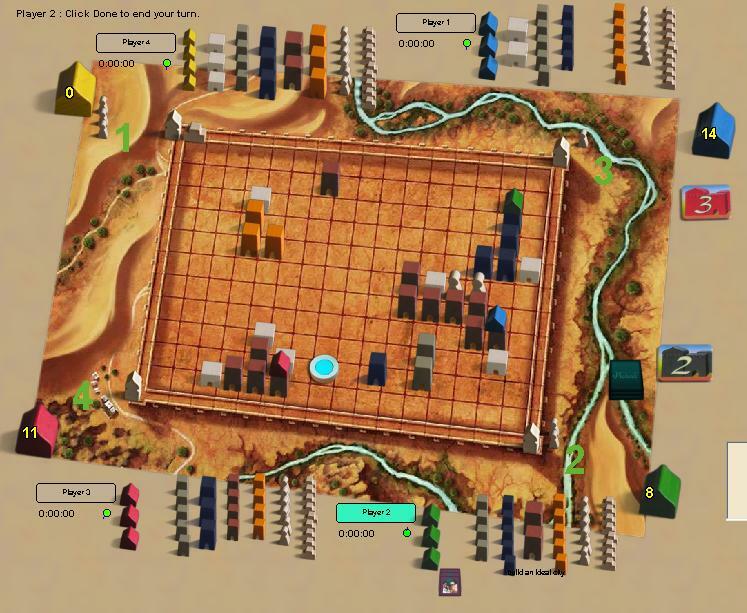 Strategy for the game revolves around when to claim your palaces, and playing pieces that benefit you more than other players. The back story: Once I had decided to expand to games with more than 2 players, Medina was high on my list because it is essentially an abstract game disguised as a euro. I researched it by playing a few games, turn based, on ludagora.net, and I got lucky on EBay to get an actual copy for a reasonable price.